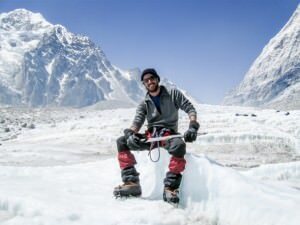 World Travellers: Ian of Borderless Travels mountaineering in India! Today on world travellers we meet Ian, more commonly known as Yak. Ian runs the excellent website Borderless Travels and shares his passion from travelling and working overseas since he was a teenager! My name is Ian but my friend call me Yak. It’s where I got the idea for my mascot, the traveling yak. Basically, I’ve been traveling and working overseas since I was 19. Now in my mid 20’s, I’ve decided to share those experiences so that other people can travel and experience the world too! 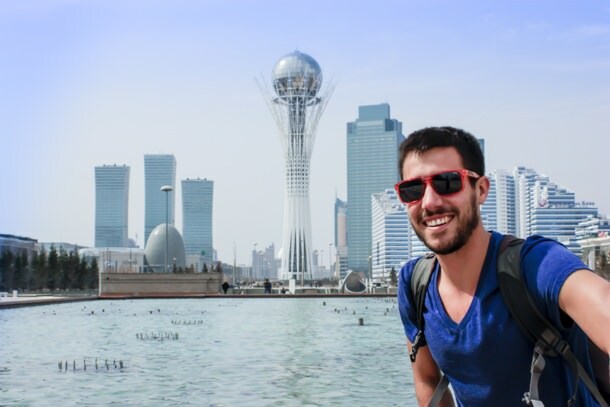 World Travellers – Ian of Borderless Travels in Almaty, Kazakstan. I’m from a small city in Southern Ontario Canada and live and work in some of Canada’s coolest cities. I’ve been to more than thirty countries around the world where I’ve worked, studied, traveled, or volunteered. Some of my highlights include Kazakhstan, Mongolia, Japan, Ghana, India and Costa Rica. Currently, I work in Canada as a teacher and use my summers to travel and work around the world. This summer I’m going to be in West Africa and Europe. World Travellers: Ian from Borderless Travels fly kicking in the Gobi Desert of Mongolia! Top three is hard because each country has been unique. I guess my top three, based on accessibility and unique things I did there, would be Mongolia, Kazakhstan, and Indonesia. I’ve had some pretty awesome experiences so it’s hard to say. If I had to choose I’d probably pick my experience getting my basic mountaineering certification in the Indian Himalayas. There I trained with the Indian Department of Defense at the Himalayan Mountaineering Institute. It was a month long course that took me on a 7 day trek to HMI’s base camp where I trained on a massive glacier at 16, 000 ft. on the Indian/Nepal boarder. During the course I learned things like ice climbing and rescue as well as how to successfully participate in an expedition. 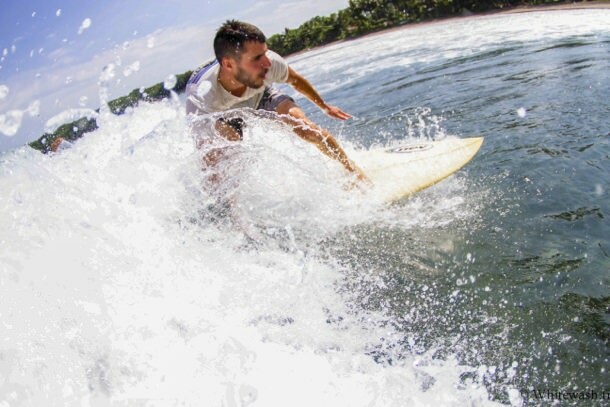 World Travellers: Ian from Borderless Travels surfing in Indonesia! Like most travelers my worst experience was probably getting sick. While in the Philippines I caught a wicked bout of food poisoning and had to spend 48 hours in my windowless particleboard walled room throwing up. My funniest experience was probably when I spent the day hanging out with several train cars on the Trans-Siberian train my friends and I were on. 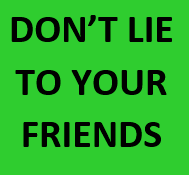 I started off hanging out with some Russian soldiers, followed by a meal and a few drinks with a couple of Russian thugs, then an afternoon with a Uzbek family. Let’s just say, when I disembarked in Moscow I had to walk through the whole train to say goodbye to everyone. When I got to the soldiers train car we reminisced about the hilarious time we had trying to speak to each other, and how I almost threw up tasting the army rations before they accepted me as part of their battalion and gave me an engineering pin to solidify it. World Travellers: Ian from Borderless Travels at twin lakes in the Philippines. There have been a few, but the one time I truly feared for my life was on a motorcycle trip to the twin lakes (mountain lakes) in the Philippines. 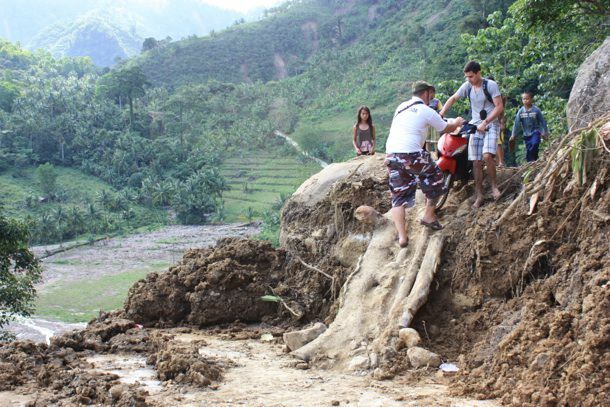 In 2009 there were landslides making it very difficult to get to this particular place. Instead of hiring someone to drive us, my German friends and I rented commercial scooters and tried on our own. Several times I almost fell of the side of the cliff and when my flip-flop broke, trying to walk and drive it up a mudslide, I thought I was done. Luckily, we pushed on and made it to the lake and back. I’m a lot more cautious on bikes now. Pack light, save money, and stay open-minded because it’s the experiences you don’t plan for that you’ll remember for the rest of your life! This summer I’ll be heading to Kenya to lead a school group on a Me to We volunteer trip. After which I’ll head to Switzerland to work for a month then travel through Eastern Europe with my sister and her friend. Where, I have no idea, and when I’m coming back to Canada time will only tell. Lets just hope my money doesn’t run out before I get home. 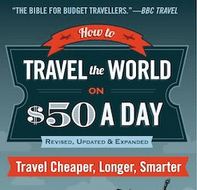 Thanks to Ian from Borderless Travels for being the latest in my series of World Travellers! 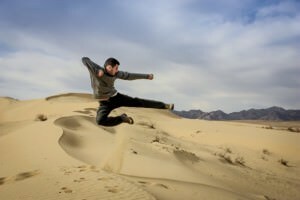 If you travel the world and run a travel blog or are a travel writer, please get in touch, you can be featured (there’s a HUGE waiting list at present), either e-mail jonny (at) dontstopliving (dot) net or head to my contacts page and get connected! You can also subscribe to Don’t Stop Living by filling in the form below! Safe travels! ← My Next FIVE Travel Destinations Planned! !